Yesterday was my sister’s birthday so the kids and I made these chocolate chip cookie blondie bars to celebrate. Because if I lived close to her then I would have been bringing these to her. She’s pregnant with twins and I am pretty sure every pregnant lady needs these deliciously chewy and chocolatey cookie bars. In fact, everyone needs these because they are so crazy delicious. 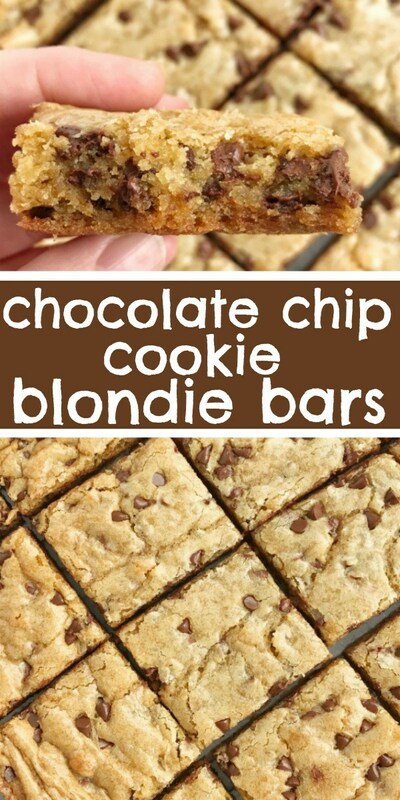 Chocolate chip cookies seem to be the universal treat that everybody loves, so why not make it easy and make them into chocolate chip cookie bars instead. No more doing batches of cookies, instead you spread the chocolate chip cookie dough into a pan and bake! These bars bake up in a 9×13 baking pan and they are thick, chewy, and buttery cookie bars. The edge pieces are a bit crispy (in a good way) and the middle pieces are so soft. I normally don’t like edge pieces of bars but these were an exception. They were my favorite! I love using the mini semi-sweet chocolate chips in these bars because then there is more chocolate spread through out the bar. You can use regular semi-sweet chocolate chips if that’s what you have. But try the mini ones, I love them and always have to buy a couple bags of them when I go grocery shopping. Heat oven to 350 degrees. Spray a 9×13 baking pan with cooking spray and then line with parchment paper. The cooking spray will help the parchment paper stay in place. Or, just use cooking spray.